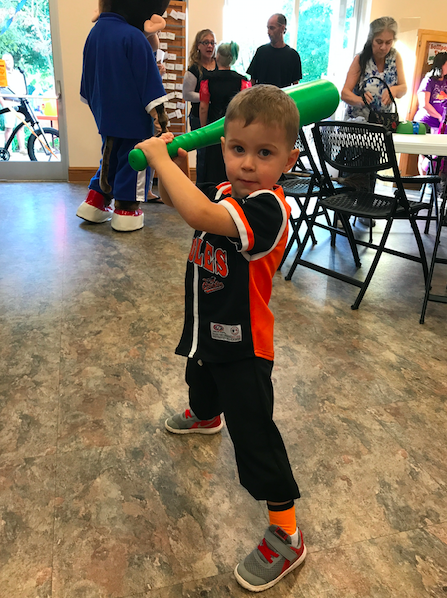 What will I learn from coaching tee ball? Austin was "a baseball guy" for Halloween. Spring is here! I know it doesn’t feel that way everywhere (seriously, the weather this year), but I’m looking forward to warmer weather, greener lawns, and baseball. Well, not only baseball, but tee ball. My son is 3 (pictured above), and this will be his first season of organized sports. When the league managers were looking for parents to volunteer to be coaches, I signed up immediately. Opening day is right around the corner. Now admittedly, I’m a competitive guy. Whether it’s an athletic endeavor or a friendly card game, I’m doing what I can to win. But when it comes to coaching youngsters (especially THIS young), expectations need to be tempered. Some of these boys are learning to hit, field, and throw for the very first time. I need to always remember that this is for fun, and “coaching” tee ball may be more accurately described as chasing the players around for an hour on Saturday mornings. But, I get to spend time with my son and teach some young athletes the fundamentals of the game. I know I’ll enjoy it. Is there a better way to test your patience and resolve than asking a bunch of 3 year-olds to line up, follow directions, wait their turn, and pay attention? Heck, I’ve spent enough 1:1 time with my own son to know that listening is not the greatest asset of a toddler. But, by implementing fun and creative approaches at practice, I have a feeling the team will be receptive to coaching. I’ve had great coaches in my life. It didn’t matter which sport it was, the best coaches that I’ve had always were able to adapt to the situation and the player. In addition to being a dad and coach, I manage an incredible group of professionals at a large technology company. I can’t manage everyone the same way. Some folks respond better to public recognition while others prefer the kudos in a smaller setting. Which players will respond to enthusiasm and excitement? Who would rather be pulled aside and discuss the situation? I’ll need to learn this quickly. This one seems really obvious and basic, but it is actually multifaceted. I need to work with assistant coaches on how to work together during drills. I have to coordinate with parents about snacks for the kids each game. League managers will follow up on how things are progressing. Isn’t this just tee ball? How many people do we need? To create a great experience (especially for the players), we all need to work together. I’m sure there will be others, and I hope to have updates as the season goes on. What have you learned from coaching youngsters? Have you been able to translate those lessons into similar situations at work? I’m so looking forward to the season, and I hope to come out of it as a better manager, coach, and father. Nick lives in Wake Forest, NC and is a manager at a large software company. He is married to his wife, Brittany, and is the father of two boys, Austin and Conner. Nick loves sports, food, and people. Nick is on a mission to understand how individuals can get the most out of themselves to build better families and teams.